Even though I don’t have a birthday this year, we still celebrated a few times in recent days, most notably two nights ago when Gail cooked dinner for 13. And what a dinner it was! If only I had taken some photos. In their absence—and in the absence of any ability on my part to convey the wonderful food in words—all I can do is describe the menu. Gail laid out a cheese platter, crackers, and olives to start. I missed all that. I was busy planning the wine, organizing beverages, getting enough chairs around the dining table, then getting everyone seated and serving drinks. Gail partially plated the food in the kitchen with Chilean sea bass and black rice. The sea bass had been marinated in a mix of saki, mirin, white miso, and more, then dressed in sesame oil and soy sauce. There was green onion too, and maybe more. The rice was served plain. In a bowl for us to dish out was sesame noodles with pea pods, red peppers, scallions, and again probably some other vegetables. Another bowl had the salad, consisting of red leaf lettuce, arugula, peas, asparagus, and a champagne-vinegar-olive oil-mustard vinaigrette. I had selected three red wines to serve with the meal. Given that we had just the one course before dessert, this wasn’t exactly a wine pairing. Just a sequence of wines I thought would be interesting to try. And I didn’t sequence them well, because I wasn’t sure we’d need more than two bottles. (Not everyone was drinking wine.) The one I put in reserve, which we did get to, should have been first. We began with Stryker Sonoma‘s 2002 Monte Rosso Vineyard Cabernet Sauvignon. We had received two bottles of it in our club shipment in the fall, with winemaker Tim Hardin explaining that “during the 2002 harvest, I brought in an exceptional crop from Monte Rosso Vineyard and decided that we would age 50 cases … for our Club Members. I’ve released this library selection exactly 10 years to the month. The wine shows us just how age-worthy our wines have become.” It was superb. I wish we had bought more. Next was McCrea Cellars‘ 2006 Sirocco, a southern Rhone style blend (41% mourvèdre, 36% grenache, 13% syrah, and 5% each counoise and consult) from Washington State that I wrote about two months ago. It has been one of our favorites recently and we were eager to share it. Among the oldest Pinot Noir plantings in the Russian River Valley, this vineyard produces a wine that demonstrates the multi-layered complexity achieved only with old vines and very low yields. Shows an incredible range of fruit and a density, leading toward age worthiness. Planted in 1974 and yields just 1 to 1.5 tons per acre. As Porter Creek club members for a little over a year, we’ve tried several of their pinots, but this was our first from Hillside Vineyard. It didn’t seem to be as popular with our guests as the others, for which I blame myself, both for my poor sequencing of the wines and for opening it while it still had aging to do. I thought it was great myself. Maybe my favorite of the three. But no doubt it will be even better with a little more time. Oh, dessert. Boy was that a treat. Talk about labors of love. 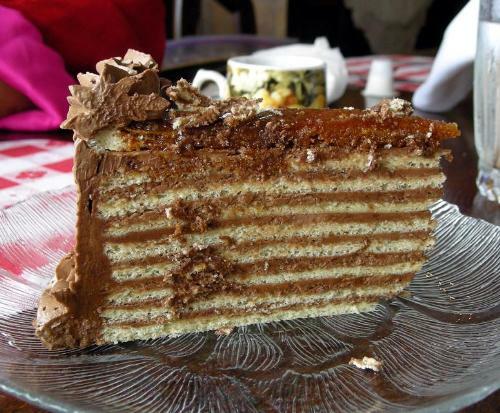 Gail decided to create a version of the Jewish deli classic seven-layer cake, or what is essentially the same thing, Hungarian Dobos torte. (See also here.) She made nine layers, as it turned out. As best I can tell, the nine layers came from making three separate thin cakes, icing them, stacking them, then cutting the result in thirds and stacking again. Delicate work, resulting in the most wonderful of desserts. The end result: thirteen well-fed and happy people. Thank you Gail. Love the picture! I grew up eating this cake under a different name; Schichttorte. Both my grandparents are from Germany and this was a childhood staple for me!